The graphics specialist continues its breakneck pace of advancement in AI and computing with the release of the GV100-Titan V, a card powered by the world's most powerful GPU computing architecture. The latest 3d-quarter 2017 GPU market data from Jon Peddie Research indicates that Nvidia (NASDAQ: NVDA) has gained the lead in market share over their rival Advanced Micro Devices Inc (NASDAQ: AMD). Over the past couple of years AMD has made strong gains in the discrete graphics processing units (GPU) business which includes all graphics boards from manufacturers. In fact, AMD, a company that in 2014 had less than 14% of the discrete GPU market, commanded by the end of 2016 nearly 30% of that very same market. By comparison, Nvidia’s market share in 2015 was over 78%, a number suggesting eight percentage points in claw back market share-wise from AMD during the 2015 – 2016 period. However, the latest research numbers show that the momentum has swung in Nvidia’s favor. Nvidia’s market share gains during the 3d-quarter of 2017 jumped 29.5%, bringing the chipmaker’s market share dominance to 72.8% vs. 69.7% in Q2’17. AMD on the other hand saw Q3’17 shipments increase just 7.6% while their market share dropped to 27.2% vs. 30.3% during the previous quarter. Nvidia’s overall GPU unit shipment growth was also superior to Intel’s (NASDAQ:INTC) 5% increase. Beyond a 34.7% jump in discrete desktop GPU shipments, Nvidia saw also a 22.4% jump in discrete notebook GPU shipments as well as a total PC graphics shipments increase of 29.5%. Nvidia has also built up a commanding lead over AMD when it comes to new growth areas such as artificial intelligence (AI) and high performance computing. This week in fact, the Santa Clara, California-based company which seems to be firing on all cylinders in the GPU market, unexpectedly revealed at the 2017 Neural Information Processing Systems Conference the world’s most powerful GPU computing architecture. Designed more as a workstation-level AI compute card (that doesn’t mean that you can’t do graphics on it, it just means that gaming is not the main focus of the card), Nvidia’s “GV100-powered Titan V” — which as a video card is based on Nvidia’s advanced Volta microarchitecture, a type of GPU architecture that is at the forefront of the AI revolution and one that includes tensor cores, a new type of core or mass collections of arithmetic logic units geared specifically for tensor deep learning operations — contains 21.1 billion (yes, billion) transistors on a 815 mm2 chip that can apparently deliver a full 110 teraflops of processing power. Besides its raw horsepower, Titan V is also 9 times more powerful than Titan X, its predecessor. The card also features 12 gigabyte of HBM2 memory and is now available for sale from Nvidia’s website for $2,999. A bit steep, yes. 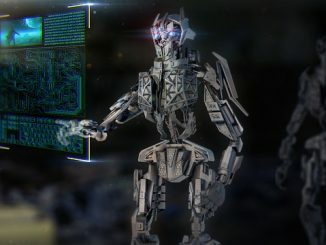 However, one should keep in mind that the card’s new architecture is specifically designed to drive the next wave of advancement in AI and computing. 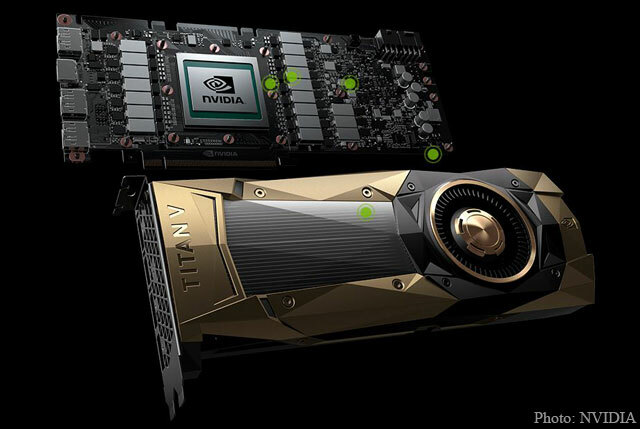 Additionally, the Nvidia GPU Cloud supported Titan V card comes for the first time in a form factor that allows the transformation of a consumer PC into an AI supercomputer. Also, when compared with the Tesla V-100 PCIe $10,000 card, the Titan V as the most powerful graphics processing unit of all time is definitely cheaper. By bringing the GV100 price point substantially down, expect the card’s next-generation to dip below the $3,000 mark. As anandtech’s Ryan Smith & Nate Oh point out, “the idea of the “prosumer” Titan has died with this card”. “With Titan V, we are putting Volta into the hands of researchers and scientists all over the world. I can’t wait to see their breakthrough discoveries,” Huang said. In all, and without mentioning here Nvidia’s focus on other high-growth industries such as datacenter, self-driving cars and Internet-of-Things, Nvidia looks set to continue consolidating its position in the discrete GPU market thanks to the speedy adoption of AI, a fact that bodes well for shareholders. Nvidia shares have more than doubled in the last 12 months. The name is currently trading at $191 per share, printing a 2-year return of more than 650%. Last month, NVDA reached an all time high of $218.67. On an earnings basis, ticker trades at about 48x earnings, a big number given the sector’s lower multiple. For reference, Intel trades at about 3x sales. Still, the company’s impressive earnings growth (Nvidia has beaten on EPS/Rev estimates for eight straight quarters) seems for the time being to have displaced any fundamental concerns.